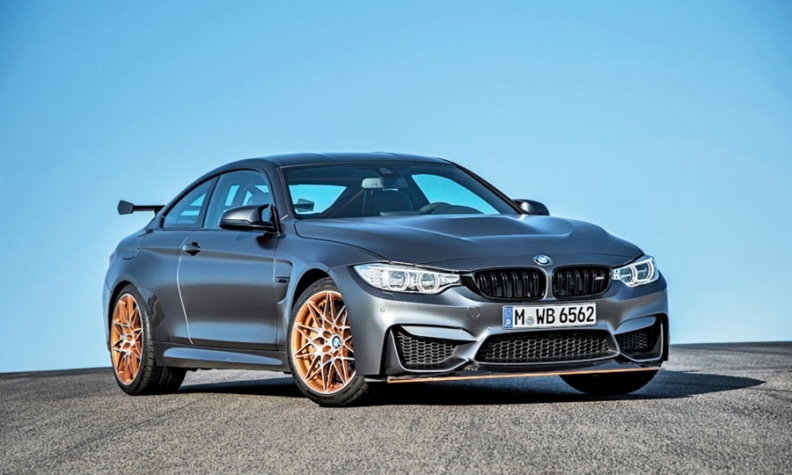 The 2016 BMW M4 GTS has a huge rear wing, plenty of custom bodywork and factory-fitted, six-point harness-equipped racing seats. But the really intriguing stuff is under the hood: This limited-edition take on BMW's performance coupe gets a big performance boost courtesy of water injection. BMW says it is a piece of wunder-tech borrowed from airplanes and drag cars that increases performance and decreases harmful emissions. On the M4 GTS, three injectors blast water into the intake plenum. The water quickly evaporates, lowering the temperature of incoming air by as much as 80 degrees more than an intercooler would. As a result, turbos can be operated at higher boost -- all while nitrogen oxide and other tailpipe emissions are reduced. Performance gets a big uptick: 493 hp at 6,250 rpm and 442 pounds-feet at 4,000-5,500 rpm. Compare that with 425 hp and 406 pounds-feet on the regular M4. A 1.3-gallon water tank feeds the system. BMW says it's the first road car fitted with a water-injected engine. A quick bit of Internet sleuthing qualifies that claim: The 1978 Saab Turbo S apparently could be fitted with an optional system from the factory. BMW says 300 units of the M4 GTS (out of a 700-vehicle production run) are headed to the United States. Pricing hasn't been announced.